You're working in your browser, testing some new web development project, but there's a problem. And you've no idea why. So you open some documentation in a separate browser tab, more in your development environment, maybe a separate PDF or two until you find whatever you need. Alternatively, you could just install DevDocs, a free Chrome app which gives you speedy access to documentation for 190 technologies from one interface. The full list is available in a left-hand sidebar. Select whatever you need and those items are grouped at the top of the sidebar for easier browsing. Navigation is much like any other web manual. Each set is presented in a tree form, and you're able to expand it, open sections and read their contents, or use the built-in fuzzy search tool to locate specific topics. The default view accesses web content at devdocs.io, ensuring you’ll stay up-to-date, but there's also an Offline feature which downloads your choice of topics. DevDocs has some omissions -- no Java? -- and with no updates since May this year, these gaps might not be filled any time soon. But it's also easy to use and a likeable app, so if you're interested in the idea, give it a try. 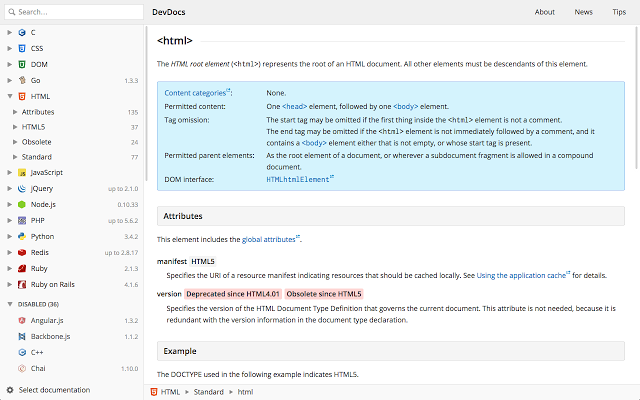 DevDocs is a free app for Google Chrome.